Summary: They say bad things come in threes and Avery is about to find out just how true that statement is. Having her boyfriend break up with her, being turned down for early acceptance at Duke University and the sudden death of her former best friend, Nora, leaves Avery feeling bereft and adrift. Struggling to figure out how to salvage a future Duke acceptance and mourning her friend, Avery uses the fact that she and Nora were both adopted as the basis of her senior class project, searching for her own birth mother and hoping to impress the university with the results. Along the way she befriends Brody, and as their friendship develops into love he provides Avery with some insight into herself and her choices. Review: In a story about a young woman so consumed by getting into the same university her parents did she is willing to use her search for her birth mother as a selling point for the admissions office, Avery becomes a person who doesn’t know who she is anymore. Avery’s a complicated character as her insecurity over being adopted feeds her fear of losing her adoptive parents love. They’re her family, but somewhere inside of her she questions whether they will still care about her if she doesn’t live up to certain family standards. Except this belief is all in her head. Her adoptive parents are eager to support and love her no matter what, and meeting her birth mother reveals not everyone feels that way. Brody is my favourite character in the Year of Mistaken Discoveries by Eileen Cook. His ability to capture multi-layered moments others miss in his photographs lends also to his talent in seeing the potential of others. He comes into Avery’s life when she needs him the most, providing an anchor and a distraction as she sorts out her identity and mourns her friend. What frustrated me about Cook’s book is that I wanted to know more about Nora. Her story of trying to find her birth mother is told in a less than a chapter, a single heartbeat in the pulse of the story. But her tale sounds like it deserves its own book. A fake birth mother who exploits her for money? Rumours of a shady adoption industry in Costa Rica? A character so distraught by her findings that she commits suicide? That’s a story. I wish I could have read it, because I had so many questions. I also wish Cook had included more from Nora’s guide for Avery. If Nora’s story inspires Avery to find her own birth mother through a sense of guilt and her guide, then I wanted to know what was so inspiring about it. And again, it would have revealed more about Nora’s story. Nora is painted like she is unstable, but at the same time it sounded like she had valid reasons for her eccentric behaviour. Despite containing serious themes of suicide, questions of origins, and parental issues, it’s a remarkably light read. 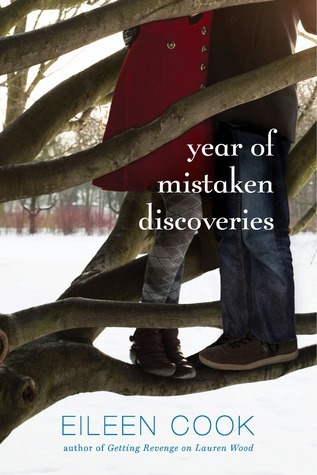 Year of Mistaken Discoveries by Eileen Cook is published by Simon Pulse, (2014).